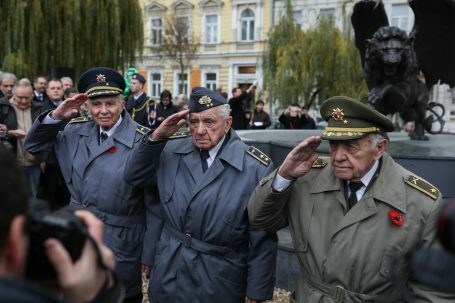 The Winged Lion Memorial Fund today unveiled a plinth below the monument in Prague that, for the first time, lists all the 2,507 names of the Czechoslovak airmen who served with such distinction in the Royal Air Force during World War II. “My Czechoslovak RAF colleagues and I were among those who helped make a difference in the effort to defeat Nazi tyranny. On behalf of my colleagues, I am pleased that our names are now inscribed on the Winged Lion Memorial, so that our endeavours, achievements and losses provide a lasting legacy for future generations,” said Flying Officer Miroslav Liškutín, DFC, AFC. The Winged Lion Memorial is a two-metre-high bronze statue situated in Prague’s Klarov area that was financed by donations worth Kc3.3 million (€128,000) from the British expat communities in the Czech and Slovak Republics. The monument was first unveiled on 17 June 2014 at a ceremony attended by surviving veterans, relatives of the airmen, as well as representatives of the Czech, Slovak and British governments, including dignitaries like the British Member of Parliament, Rt Hon Sir Nicholas Soames MP, grandson of Sir Winston Churchill, and Air Chief Marshal Sir Stuart Peach, the next Chairman of the NATO Military Committee. “It was an honour to have attended the unveiling of the Winged Lion Memorial in 2014, and this decision to list the names of all the Czechoslovak airmen for the first time in one place is a fitting tribute to the bravery of these individuals,” said Air Chief Marshal Sir Stuart Peach. The Winged Lion is placed on a concrete, circular plinth covered by Czech granite, which, when viewed from above, resembles the insignia of the Czech Air Force. It was always the intention of the Winged Lion Memorial Fund to follow up with a plaque on the plinth, which would for the first time list in one place the names of all the 2,507 Czechoslovak airmen who served in the RAF during World War II, with their full ranks and crosses next to the names of those who died in action. With the location of the monument now permanently assured, the Kc1.5 million needed for the name plaque as well as information panels about the memorial itself and the airmen it commemorates was raised by members of the Asociace obranného a bezpečnostního průmyslu ČR; AERO Vodochody AEROSPACE a.s; Sellior&Bellot, a.s; Česká zbrojovka, a.s; OMNIPOL a.s; LOM PRAHA s.p; RETIA, a.s; VOP CZ, s.p; TTC MARCONI s.r.o; EUROPIEN AIR; SERVICES s.r.o; and MEOPTA – optika, s.r.o. “I am pleased that so many of my business colleagues decided to help fund this important addition to the Winged Lion Memorial; the plinth with the names of all the Czechoslovak airmen who served in the RAF during World War II is an important milestone in recognising what these 2,507 men and women sacrificed so that we can live in liberty today,” said Jiří Hynek, President of the Defence and Security Industry Association of the Czech Republic (AOBP). Today’s ceremony to unveil the plinth was led by Cardinal Duka, Major General Sebesta, Major General Bocek and Brigadier General Vransky. “It is my pleasure that after the victory of goodwill and common sense we could participate in a ceremony that allows us to unite in the symbol of patriotism, bravery and self-sacrifice of our airmen abroad with concrete names, so that we can pay tribute and express our admiration and gratitude for the freedom they brought for our nation in a place that worthily honours their heroic deeds,” said Major General Jaromír Šebesta, Commander of the Air Force of the Czech Republic.